With more varieties than ever before to chose from, including altogether new gems, revolutionary new cuts, and new ways to buy gems - such as Internet auctions and TV shopping - there has never been a more exciting time to buy or collect colored gemstones. But there are also new high-tech treatments and sophisticated frauds to look out for. Lack of information, error, or misrepresentation can make the thrill of buying a gem or piece of jewelry confusing, intimidating, overwhelming, and costly. Buyers need a source of expert guidance. This practical, comprehensive, easy-to-understand guide provides all the information you need in order to know what to look for and what to look out for, including: What qualifies as a "gemstone"? How to evaluate color - and its impact on price. Deciding between a natural gem and an enhanced gem. Colored gemstone synthesis and treatment. What to ask for when buying the stone. What to get in writing. How to get what you want within your budget. Price guides for popular gems, opals and synthetic stones. Important information about buying on the Internet... and much more! Written by an insider, this easy-to-read guide is the "unofficial colored gemstone bible" for anyone who wants to get the most for their money and enjoy what they have purchased. Soft cover, 6" x 9", 180 pages. Buying a diamond ring may be one of the most important jewelry-related decisions you will ever make. The Diamond Ring Buying Guide was designed to help you get the best buy possible. Written in clear, everyday English, with lots of color photos, this book shows you step-by-step how to evaluate diamonds and settings. It's helped thousands of diamond buyers make smart choices - and it can help you too. TheDiamond Ring Buying Guide offers tips on evaluating quality, detecting fakes, selecting ring styles, diamond treatments, gold & platinum, and savvy buying. There's one thing this guide doesn't offer, and that's free diamond samples. But with the information and skills you'll learn from reading this book, you're sure to get good value for your money - and that's worth its weight in gold! Whether you are buying a diamond for an engagement ring, anniversary, to commemorate a special moment, or for personal pleasure, today it is more important than ever to understand what you are buying. There are new shapes and cuts, fancy colors, high-tech treatments, and sophisticated frauds. There are new ways to buy - such as Internet auctions and TV shopping. Buyers need a source of expert guidance. Practical, comprehensive and easy to understand, this book offers in depth all the information you need to buy sparkling diamonds with confidence, including: What is a diamond? The factors affecting quality differences in diamonds. Diamond grading reports and how to interpret them. How to compare prices. How to spot differences in stones that may appear to be the same quality. How to protect yourself from misrepresentation. Question to ask when buying any diamond. What to get in writing. How to get what you want within your budget. And much, much more! Written by an insider, this easy-to-read guide is the "unofficial diamond bible" for anyone who wants to get the most for their money and enjoy what they have purchased. Soft cover, 6" x 9", 184 pages. Engagement & Wedding Rings takes the fear and anxiety out of buying an engagement or wedding ring, restoring the romance and the magic of this once-in-a-lifetime experience. You'll find everything you need to know to select, buy and enjoy that perfect ring... to truly experience the wonder and excitement that should be part of finding - or creating - it. Engagement & Wedding Rings is filled with useful information to help you make the right choice, including: Romantic traditions behind engagement and wedding rings. How to select the right style and design for you. Tricks to get what you want on a budget. Steps to compare prices properly. How to select the perfect bridal pearls. The latest cuts, ring styles and designs. Secrets to differences in diamonds and colored gemstones that may appear to be the same quality. How to select your jeweler, appraiser, and insurer. What to do to protect yourself against fraud - what to ask and what to get in writing. Tips on Internet shopping... and much, much more! Dazzling color section features over 100 different rings showing antique to contemporary designs. Over 400 illustrations and photographs. Soft cover, 6" x 9", 283 pages. Gem Identification Made Easy is the first and only book that explains in non-technical terms how to identify diamonds and colored gems and separate them form imitations and look-alikes. The book's approach is direct and practical, and its style easy to understand. In fact, with this highly accessible guide, anyone can begin to master gem identification. Using a simple, step-by-step system, the authors explain the proper use of essential but uncomplicated instruments that will do the identification tasks, what to look for gemstone by gemstone, and how to set up a basic lab at modest cost. Three of the instruments are inexpensive, portable, pocket instruments which, when used together, can identify almost 85% of all precious and popular stones. The key to avoiding costly mistakes and recognizing profitable opportunities is know both what to look for and what to look out for. Gem Identification Made Easy will help you: Open your eyes to the types of imitations, synthetics, look-alikes and fakes in the gem market today. Learn how to tell the difference between them. Quickly spots synthetics, including synthetic emeralds and diamonds, filled diamonds, diffused "blue" sapphires and "red" rubies, and much more. Discover how to identify new gems such as "red" emerald and "Mandarin" garnet. Know when to seek help from a professional gemologist or lab. Become more professional in you business or hobby. Hard cover, 6" x 9", 322 pages. What's the "REAL" price? How could I get a break on the price of that stone? Is the gem with more green or more yellow in it worth more? Is that gem merchant treating me fairly? How can a jeweler sell more high-profit colored stone jewelry and tie up less capital? These are some of the questions answered and some of the secrets revealed by this famous gem merchant/cutter and author. If you have asked questions like these and found evasiveness or silence as your reply, you should read this book. The Gem Merchant is not just a must for gem merchants, gemologists and appraisers; it is a book particularly for the jeweler who wants to make more money with colored stones, and for gem lovers in general. Soft cover, 6" x 9", 158 pages. The premier book of its kind, updated and expanded. A comprehensive guide to the standards, procedures and ethics of appraising gems, jewelry and other valuables. Gems and Jewelry Appraising contains expert practical guidance, combined with detailed descriptions, photos, case studies, pricing data, key documents and more. This guide offers all the information that practicing or aspiring appraisal professionals will need to establish an appraisal business and handle various kinds of appraisals - for insurance, divorce, inheritance, liquidation, collateral and tax donation - and provide an accurate, verifiable estimate of value. Chapters include The Appraiser, Appraisal procedures and the Nature of Value, Conducting the Appraisal. Research and Analysis: How to Estimate Value, Jewelry from Antiquity to the Modern Era, Valuing Watches, Coin Jewelry, Carvings and Other Articles, Legal and Ethical Aspects of Appraising, and Preparing the Appraisal Document. Hard cover, 9" x 11.5", 222 pages. Buying colored gems is a challenge. To make a wise choice, you must be able to judge their color, flaws, transparency and brilliancy. The Gemstone Buying Guide will show you how. Written for both consumers and professionals, it's easy to read, has over 200 color photos and gives practical pointers on how to buy the best stone for the money. Whether you're interested in jade, opal, ruby, topaz, spinel, garnet, tourmaline or some other colored gem, you'll find the Gemstone Buying Guide to be a fascinating and valuable resource. Get straight talk on: Price Comparison, Quality Evaluation, Fake Stones, Gem Treatments, Gem Cleaning and Care and Savvy Buying. 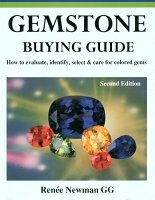 Chapters include: Colored Gem Price Factors in a Nutshell, Shape & Cutting Style, Carat Weight, Gemstone Color, Judging Clarity and Transparency, Judging Cut Quality, Evaluating Star & Cat's-Eye Stones, Treatments, Synthetic Stones, Deceptive Practices, Gemstone Descriptions and Caring for Your Gems. An appendix includes Birthstones & Anniversary Stones and Suppliers of Jewelry & Stones for Photographs. Also included is a comprehensive Bibliography and Index. Soft cover, 7" x 9", 156 pages. Have you ever had a chain break right after you bought it? Have any of your stones fallen out of their settings? Do you wonder if your "gold" jewelry is really gold? The Gold & Platinum Jewelry Buying Guide shows you how to spot poor craftsmanship and imitation gold or platinum and gives you a wealth of information on chains, multi-colored gold, and platinum alloys. Gold & Platinum Jewelry Buying Guide is packed with color photos and step-by-step guidelines on evaluating craftsmanship, detecting fake metals, determining karat value, making practical choices, caring for your jewelry and finding a good buy. Soft cover, 7" x 9", 156 pages. There is far more to appraising jewelry than just being able to put a dollar value on an item. The title of the appraiser also distinguishes the individual able to identify, witness, estimate status, excellence or potential, and determine the authenticity of the article. Many factors impact on a thorough appraisal, especially estate and period jewelry. This beautifully illustrated, complete guide to accurate jewelry identification and appraisal provides step-by-step instruction of jewelry identification and dating, reviews the role and responsibilities of the appraiser and describes in detail virtually every style of antique and period jewelry, from Georgian and Victorian to modern, "retro" and ethnic jewelry art. Illustrated Guide to Jewelry Appraising offers expert information and clear, insightful guidance on all aspects of appraising. Included are a wealth of photos and figures, case studies, typical problems, pricing data and key documents. Chapters include The Appraiser, Appraisal Procedures and the Nature of Value, Conducting the Appraisal. Research and Analysis: How to Estimate Value, Jewelry from Antiquity to the Modern Era, Valuing Watches, Coin Jewelry, Carvings and Other Articles, Legal and Ethical Aspects of Appraising, and Preparing the Appraisal Document.Hard cover, 9" x 11.5", 194 pages. A source of expert guidance to help you enter today's fastest growing marketplace for gems and jewelry. This definitive guide to buying and selling at auction covers both the unique risks and the opportunities to be found at the auction house and on Internet auction sites. 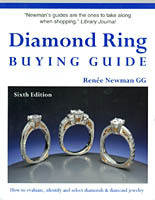 Entertaining, informative, and packed with tips from an insider, this practical, easy-to-understand guide makes available detailed information on what distinguishes auction buying and selling from other methods; the rules of the game for buying and selling at auction; what you need to know before bidding on diamonds, colored stones, pearls, gold and platinum; design and style: great jewelry periods and great jewelers; special concerns when buying and selling on Internet auction sites; how to avoid the pitfalls when buying and selling at auction; what auctions do guarantee and how to protect yourself against what they don't guarantee, and much more. Soft cover, 6" x 9", 309 pages. Purchasing gems and jewelry can be a magical experience, filled with excitement and anticipation. But lack of information, error, or misrepresentation can make the thrill of buying a gem or piece of jewelry confusing, intimidating, overwhelming and costly. To help you avoid the pitfalls and keep the magic, two internationally respected experts on buying gems and jewelry put their inside knowledge to work for you in this easy-to-read and easy-to-understand guide. It is filled with practical advice and is designed to make it easy for you to have all the information you need to buy gems and jewelry with confidence. In simple, straightforward terms you'll learn about the four Cs and how to juggle them to get what you want at the price you want to pay, what to look for and what to look out for, all about gold and platinum, jewelry design, and some of the country's leading designers. You'll learn what questions to ask and what to get in writing, and even how to select the jeweler, appraiser and insurer. With Jewelry & Gems: The Buying Guide you'll find the experience can be a joy, and the gems and jewelry you select a source of lasting pleasure! Soft cover, 6" x 9", 278 pages. For people who want an informed and reliable source of information to guide them in the fascinating and complex world of pearls, The Pearl Book provides the information you need to buy beautiful pearls with confidence. Learn how to select, buy, care for and enjoy pearls. Chapters include Pearls: First Among Gems, What Is a Pearl?, The Difference Quality Makes, Selecting Pearls to Treasure, Lustrous Advice from Illustrious Experts, Wearing and Caring for Pearls, and Important Advice Before and After You Buy. Included are A Practical Pearl Glossary, Price Guides, Special Charts and a Color Photograph Section. A must read for anyone preparing to take the plunge and purchase pearls or pearl jewelry. Soft Cover, 6" x 9", 198 pages. Pearl Buying Made Simple - When making a major purchase, be it computer, car or gem, it's best to know what you're looking for and how its quality is rated. The Pearl Buying Guide is the first book to give consumers details on judging pearl quality and value. 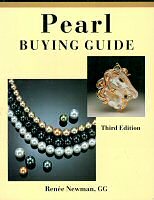 Written in easy-to-read everyday English, with lots of explanatory photos, this book gives clear, step-by-step pointers on how to buy the best pearls for the money. You'll find out how to tell a fake pearl from a real one, how to compare pearl prices, how to choose good quality pearls, how to save money on your gem purchase, and how to turn a pearl necklace into a versatile piece of jewelry. Chapters include Why Read a Whole Book Just to Buy Some Pearls?, Curious Facts About Pearls, Pearl Types and Shapes, Judging Luster & Nacre Thickness, Judging Color, Judging Surface Perfection, Size, Weight & Length, Judging Make, South Sea Pearls, Black Pearls, Freshwater Pearls, Pearl Treatments, Imitation or Not?, Natural or Cultured?, Choosing the Clasp, Versatile Ways to Wear a Strand of Pearls, Caring for Your Pearls, and Finding a Good Buy. Soft Cover, 7" x 9", 156 pages. Where can you find details on what to look for in colored gems? Not in a jewelry store brochure, not in a gem lore book, nor in a promotional video. Your local jeweler doesn't have a whole day to explain how color, shape, cut, clarity, transparency, geographic origin and treatments affect gem value. Let the Ruby, Sapphire & Emerald Buying Guide provide the in-depth information you'll need to be a smart buyer. Written for both consumers and professionals, it's easy to read and has over 150 high-quality color photos. The Ruby, Sapphire & Emerald Buying Guide provides straight talk on quality evaluation, gem treatments, fakes and synthetics, jewelers and appraisers, gem cleaning and care, and savvy buying. 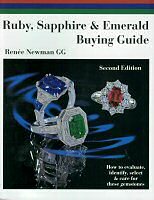 Chapters include Why Read a Whole Book Just to Buy a Gemstone?, Curious Facts About Emeralds, Rubies and Sapphires, Carat Weight, Shape and Cutting Style, Judging Ruby Color, Judging Emerald Color, Judging Sapphire Colors, Judging Clarity and Transparency, Judging Cut, Ruby & Sapphire Treatments, Emerald Treatments, Imitation or Real?, Synthetic or Natural?, Star Rubies & Sapphires, Caring for Your Ruby, Sapphire and Emerald Jewelry, and Finding a Good Buy. Soft cover, 7" x 9", 164 pages.